Ann Morgan writes in the opening of this delightful book, "I glanced up at my bookshelves, the proud record of more than twenty years of reading, and found a host of English and North American greats starting down at me…I had barely touched a work by a foreign language author in years…The awful truth dawned. I was a literary xenophobe." Prompted to read a book translated into English from each of the world's 195 UN-recognized countries (plus Taiwan and one extra), Ann sought out classics, folktales, current favorites and commercial triumphs, novels, short stories, memoirs, and countless mixtures of all these things. 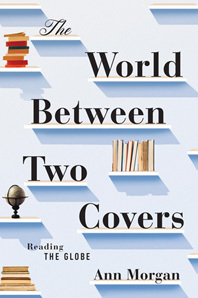 The world between two covers, the world to which Ann introduces us with affection and no small measure of wit, is a world rich in the kind of narratives that engage us passionately: we meet an irreverent junk food–obsessed heroine in Kuwait, an explorer from Togo who spent years among the Inuit in Greenland, and a former child circus performer of Roma background seeking sanctuary in Switzerland. Ann's quest explores issues that affect us all: personal, political, national, and global. What is cultural heritage? How do we define national identity? Is it possible to overcome censorship and propaganda? And, above all, why and how should we read from other cultures, languages, and traditions? Illuminating and inspiring, The World Between Two Covers welcomes us into the global community of stories.